100% ceramic nonstick, 100% toxin-free. EXCLUSIVE ECO-FRIENDLY We’re excited to introduce the new Sur La Table-exclusive Diamond + Evershine collection from GreenPan. Health-conscious cooks will appreciate this completely toxin-free collection that boasts revolutionary Diamond Thermolon Pro 100% pure ceramic nonstick that’s reinforced with diamonds to make the coating four times more conductive than copper. This dishwasher-safe ceramic nonstick coating provides superior release, is safe for metal utensils, and is completely free of toxic chemicals or persistent pollutants. Cast solid ergonomic, stay-cool rivetless handles are more hygienic and easier to clean than their riveted counterparts. 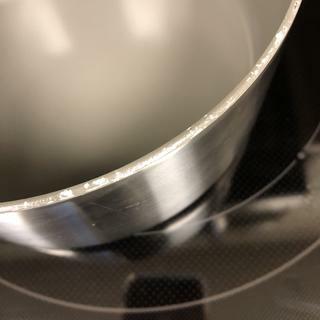 Heavy-gauge tri-ply construction features an aluminum core between two layers of stainless steel, which ensures excellent heat conduction, making this saucepan perfect for everything from simmering to boiling. Included glass lid keeps moisture and heat contained for cleaner and more versatile cooking. Created to solve stainless steel discoloration, new Evershine technology is applied to the exterior and handles of the cookware to help keep it looking brand-new. This line of cookware is made of upcycled stainless steel and is compatible with all stovetops, including induction. Click here to read GreenPan’s tips for using, cleaning and storing your cookware. 2 qt: 14" L (with handle) x 7.25" W x 3" H (5.5" H with lid); 3 lbs. 3 qt. : 15.25" L (with handle) x 8" W x 4" H (6" H with lid); 4 lbs. The handle is extremely uncomfortable. It digs into your hand when you have anything in the pot. Best cookware I’ve ever purchased. Even heating, easy cleanup, great looking! I had my first set of pots and pans for 40 years so it was time for an upgrade! About a year or so ago I purchased a set of Caphalon ceramic pots and pans. I got rid of nearly all of my metal utensils and kept only wood and replaced metal with silicone. The Caphalon white ceramic pitted and slightly stained even with me taking great care to not mar the ceramic surface. The Greenpan was a purchase to test the difference in quality and I have to say the Greenpan is far above in quality and performance. Food heats more evenly, boils liquid much quicker and so far the ceramic surface appears to be very stable. The only downside may be that the Greenpan is quite a bit heavier than the Caphalon ceramic. I recently added a second Greenpan when Sur la Table had a sale and I'm just as happy with the quality of the new pan. In time I'm looking to get rid of the Caphalon set and slowly replace with Greenpan. So far it is the best nonstick pan I have ever used. Love it. Love these pans. They clean up easily, with a magic eraser, if needed. Have a couple earlier GreenPan Diamond skillets and love them, so got this sauce pan. So five stars for Diamond GreenPans, minus one for the smaller handles. Love this pan . Great weight and size. Cleans up super easy ! I like it and am using it everyday. Still looks brand new - excellent non-stick! I bought this saucepan a little over a month ago and I'm very happy with its durability so far. I've been using it on a daily basis (using metal utensils) and it still looks brand new. The pan heats up quick and has the perfect size and weight for my daily oatmeal breakfast or a small batch of soup. Even with a dish as sticky as oatmeal, nothing ever sticks to the pan. + I've never owned cookware with a see-through glass lid before and I have to say it's very convenient to monitor food. Non toxic ceramic is what I was looking for, appears on this brand, there are no visible handle screws on inside of pan. I wish website would show inside of pans and not with lid half off. I have two other Green pan items and love them so I ordered 2 saucepans because I need them. a FRIEND HAD THE POTS AND PANS AND RAVED ABOUT THEM. Have several other Green Pans which I depend on. Realized I did not have a good sauce pan. My Creuset sauce pan is just too heavy to be helpful once filled with anything. Eco friendly and had good reviews. I'm having a great experience with the 12-inch fry pan - same make and series. I have a saucepan made by the same company. It’s excellent. Since I need a 3 quart size pan I thought this would be a good choice. This 3 qt sauce pan purchase is to complete my GreenPan set and to replace a 3 qt. non stick saucepan that is peeling. I have other size Green Pans that I like very much. I eventually want to replace all my pans with Green Pan. LOVE LOVE LOVE THESE PANS!!!! I have others of this brand and I love them! I love these pots and pans. Non-stick, but can use metal utensils and no rivets!!! nonstick. safe with metal utensils, safe for high heat. had everything we were looking for. I've had GreenPan before. This works on my new induction cooktop. It was time to replace another pot! My sister suggested this brand. I have used Revere Ware, and Swiss Diamond and want to try something different. I have a smaller and a larger saucepan, and they are study, easy to clean, and ever so perfect. The guy tends to burn things while cooking and these have survived. No warping and still cleanable without super scrubbing. Maybe they should change the name to GuyPan, or GreenGuyPan. I just purchased a Greenpan fry pan and am enjoying it. I am looking for nonstick cookware that will last more than 4 yrs since I cook on high heat. want non toxic sauce pan with nice handle and lid. It's a gift to someone who asked for this. Bought a new stove, electric induction cooktop, and needs pans like this. Previously bought a large skillet and loved it. So when I needed new pans, I returned to this brand. Perfect size for my smallest stove burner. Also I can use it on my induction burner. Also no rivets. And it looks nice -- what more could anyone want? This has the best and most resilient coating I've ever found. I have 3 skillets and I'm happy to have this saucepan to add to my collection. I bought the pan yesterday wanted matching set. Rivetless handle, quality of nonstick interior, glass lid: my size pot for cooking rice etc. BEST ANSWER: No it doesn't but the handle is not as comfortable as the previous version. I’ve not had any problem with the handle heating up. My range is an induction model so there is no heat “spill over” from a hot burner which there might be on a more tradition gas or non-induction electric. No, it doesn’t. I love this pan. Are these Greenpan Diamond pots/pans PFOA free? BEST ANSWER: From Sur la table web page for this pan: "Safe and non-toxic ceramic coating is completely free of PFOA, PFAS and persistent pollutants as well as lead..."
My understanding is they are since they are ceramic interior. Are diamonds used for the coating ethically sourced? BEST ANSWER: What do you mean ethically sourced?